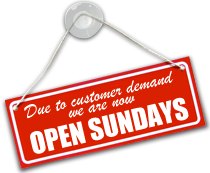 In an effort to better service our customers, Granite Countertop Warehouse and Crowe Custom Counters is now open on Sundays. We are excited to announce that we are now open on 7 days a week, making it even more convenient to visit our showroom at a time that best fits your schedule. Our showroom, design center and slabyard are now open Sundays in order to be more convenient to you…our valued customers. Whether you are remodeling your bathroom or adding an outdoor kitchen, our trained and knowledgeable design team will help pick out the perfect stone for your project. They will also be able to show you all options within your budget. With over 4000 slabs and 150 colors in stock, you can rest assured that you will find the right slab for you project. We are proud of our repeat customers. Through the years, our customers have learned to count on us to bring the finest stone available at the best prices and Sunday ours make it easier for the to shop with ease. Even on Sundays, our designers have the ability to give pricing on the spot on each and every color that you’re interested in so that you can find the stone you love without blowing your budget.